Set of equipment used to irrigate lawns. Spray systems are the most common type used for home lawncare. They are best for flat surfaces. 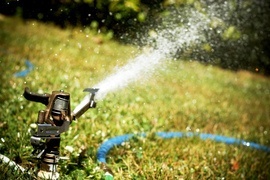 The cost of installing a sprinkler system in a standard, landscaped 8,000 square foot lawn averages $2,500 to $3,500.